After their superb win over Belton Park, Melton Mowbray Golf Club’s C team maintained their winning form at home to Kibworth. 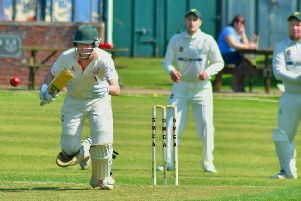 A very good spirited match was played in strong winds and ended in Melton’s favour by three-and-a-half points to two-and-a-half. The opening pair of team captain Adrian Green and club captain Glenn Price had a very close game, which ebbed and flowed one way then the other. Kibworth had a run on holes 14 and 15 to go 2-up with three to play, but Green replied with a long putt on the 16th for a birdie to cut the gap. Price then earned a half after some very good approach work to the 18th green. Brendon Boyce and Dave Mckain had a tight match, but won the last three holes to win 2-up, while Nigel Blunt and Ade Stokes put the opposition to the sword with a magnificent 8 and 6 win. Vic Cooper and John Mair earned a creditable half, as did Dave Bailey and Andy Pedlar. * Bettyne Norton enjoyed a great turnout for her Lady President’s day last Wednesday. The format was an individual medal qualifier, played over nine or 18 holes across three divisions. Denise Waldron secured the overall win with an excellent round of nett 68. Results – Division One: 1 Jean Moulds, 2 Dee Adams, 3 Julia Brown. Division Two: 1 Gay Cham, 2 Sandie Normanton, 3 Pam Parker. Division Three: 1 Sue Bennett, 2 Alison Gatward, 3 Maureen McCall. Nine-Hole Competition: 1 Jane Berry, 2 Gill Hogan, 3 Evette Joyce. Best Putter – (18 holes) Jane Berry; (9 holes) Janet Hipkin. * A field of 30 golfers entered last Wednesday’s midweek medal which produced some good golf from many of the players. The weather was fine and the greens, recovering from the winter maintenance, were running well for the stableford which counted towards the Race to Woodhall Spa (RWS) standings. David Taylor won overall with 40 points, just one ahead of runner-up Paul Blount, while Ray Cotton (38pts) took third place on countback. Guy Rayson took the twos sweep on the par-three 14th. * The men’s September Monthly Medal on Saturday brought another good turnout with many golfers returning scores below handicap. In warm and breezy conditions, the recovering greens allowed the ball to run quicker as all three divisions produced some very good scores. Jack Inguanta was the overall winner with nett 66, on countback from Malcolm Farrow and Stuart McNeill. Results – Division One: 1 Jack Inguanta nett 66, 2 Steve Wright nett 68, 3 Chris Radford nett 70. Division Two: 1 Malcolm Farrow nett 66, 2 Stuart McNeill nett 66, 3 Chris Vose nett 67. Division Three: 1 Nigel Blount nett 70, 2 Russell Freeman nett 72, 3 Sam Wright nett 75.